Successfully Added ISDB-T USB Dongle - Direct Digital TV to your Shopping Cart. 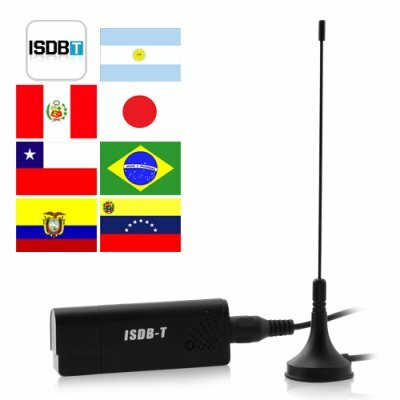 This ISDB-T dongle instantly brings the excitement of the World Cup to your computer. With one simple direct connection and software installation, you can be off watching the game before kick-off starts. The beauty of this amazing USB Dongle, is that it contains a digital TV receiver that let's you watch ISDB-T digital TV on your desktop PC, laptop, notebook, or netbook. Transform your computer into a digital TV set and DVR. The future is indeed here, and it's the ISDB-T digital TV USB Dongle! Included with ISDB-T digital TV USB dongle is a bundled software that lets you record the programs you want to watch again later. This incredible USB accessory is definitely the world's most amazing computer upgrade. Simply insert this ISDB-T dongle into an available USB port and then install the DVR software (it comes with an evaluation copy of Blaze, but there are even better open-source software solutions on the web). The software auto detects your ISDB-T region and automatically scans all available digital TV channels and adds them to your channel list. See something you want to save? Record the program immediately or schedule a future recording. It's like TiVo but it's much less expensive and there are no monthly fees! This computer accessory makes it easy for you to sit back, relax and watch your favorite programs right on your desktop, laptop, notebook or netbook computer. This digital TV USB dongle contains a digital TV receiver for processing ISDB-T MPEG-2 and MPEG-4 encoded signals found in the following regions: Japan, Brazil, Peru, Argentina, Chile, Venezuela, and Ecuador. What's more, since you'll be using the dongle style receiver for your desktop PC, laptop, notebook or netbook, all your favorite programs are saved directly to your hard drive for easy access anytime. How much programming you can save is limited only by the size of your hard drive! Be Smart - Add to Cart! Be a good son and buy one for your parents right away and get another one for your own family. Then order twenty more to resell to your online customers. Another innovative digital TV product from the online leader in direct from China wholesale electronics - Chinavasion. This unit supports both ISDB-T MPEG-2 and MPEG-4 broadcasts. What is ISDB-T? I live in Brazil and we use SBTVD. SBTVD is short for Sistema Brasileiro de Televisão Digital. It's another name for ISDB-T.